What is the science behind Magic Cake? What is the science behind this? How does the single batter separate and create three separate and well defined layers? As many photos of various magic cakes show (such as those at the recipe author's Part II, page), there is a definite edge effect on the layers, so it is not simply separation of components due to differing density. In case you are interested, the magic comes at least partly from the milk. 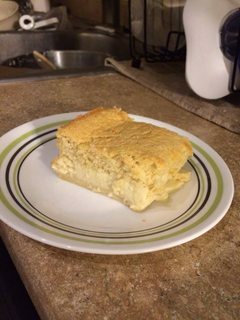 I accidentally forgot to add it (but other than that, I followed the recipe to the letter), and I ended up with a regular vanilla cake, no layers at all. I imagine this cake part should've been the (partly) the upper layer. As milk is heavier than some of the other ingredients, it sinks to the bottom and creates the custard layer. I would like to expand this answer, with a remark on what we call 'flantaart', translated as 'custard pie'. There is one batter, and after baking, a well defined crust and a custard on top. I'll look it up when I get home, to look for similarities between the two recipes. I think there are two important factors contributing to the different layers from a single batter. The first one is the oven temperature. This magic cake is baked at a lower 300-320F than normal 350-375F oven temperature. This lower temperature allows the starch in the batter to settle before coagulation takes place. This contributes to the bottom dense layer. The second factor is the large amount of liquid in the batter. In a regular chiffon cake recipe, only 10-15% of the weight is liquid whereas in this magic cake, the liquid is almost 50% of the total batter weight. This is what makes up the custard middle layer. As the starch settles in the bottom and custard forms in the middle, the air in the whipped egg white rises to the top under heat and makes up the fluffy top cake layer. Cook's Country has a recipe for Magic Chocolate Flan Cake with two layers that actually switch places (top to bottom) during baking. I know it's not the same as your Magic Cake, but they explain how it works just below the recipe instructions. My hunch is that some of the same principles are at work in your cake. While our Magic Chocolate Flan Cake is baking, the cake layer and flan layer switch places in the oven. Amazingly, they don’t mix together; they just reverse positions. How is that even possible? Our science editor explained that the combined baking soda and acidic buttermilk in the cake layer produce gas, making the cake less dense than the flan. The (lighter) cake layer rises and the (denser) flan layer sinks. The water bath is critical, too. Since the water comes only halfway up the Bundt pan, only the top half of the pan gets hotter than the boiling point of water. As the cake batter slowly heats up from the surrounding hot water, it expands (from the gas), pushing the flan layer higher. The eggs in the flan are thus exposed to more heat at the top of the Bundt pan, so they cook and start to solidify. The solidifying flan can’t fuse with the (still fluid) cake batter, and since it is denser, the flan sinks and the batter seeps up at the edges of the pan. Once the lighter cake batter rises to the top, it is exposed to the higher temperature at the top of the Bundt pan and it finally sets. Not the answer you're looking for? Browse other questions tagged baking cake food-science or ask your own question. How does a chocolate pudding cake work? What is the chemical process behind the way you cook a risotto? What is the difference between Devil's Food and Chocolate cake? Resources that explain the science of cooking? What's the science behind making German potato dumplings (Knödel) fluffy but not fall apart? What happened to my cake? What causes a cake to sink in the center?